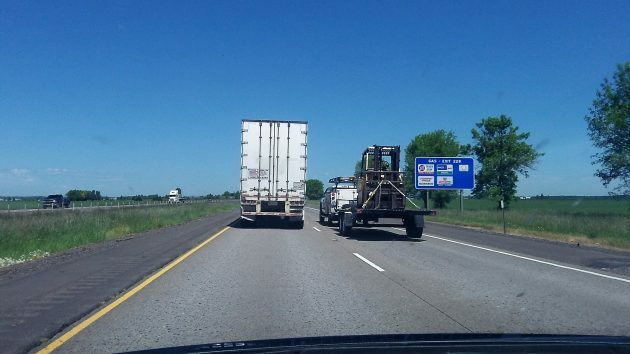 The proposed left-lane law would not affect this situation. But look at the blue sky in this shot from the files! On a slow day you can always amuse yourself by browsing what the Oregon legislature is up to. Take, for instance, the left-lane bill that cleared a Senate committee last Wednesday by a vote of 4 to zip. The bill is SB 532, and it’s a favorite of Democrat Ginny Burdick of Portland, who introduced it before and did so again this year. Like many people, she is sick of drivers on I-5 hogging the left lane and not letting her pass. Her bill, which was cosponsored by Albany Republican Rep. Andy Olson, among others, requires drivers to use the right-hand lane on multi-lane roads where the speed limit is 55 mph or greater. Exceptions are made for passing and other things, such as congestion, road conditions and making way for traffic entering the highway. If the bill passes and people become aware of it, if anything there might be more needless back and forth between lanes. There’s not likely to be any enforcement. If a trooper gets behind a left-lane hog to document the offense, the driver in front is going to get out of the way right quick. So then, where is the offense? Most of us are aware lanes changes at speed add to the probability of accidents. Now in the case of Capt Bill Fugate’s trips between Salem and Portland, of course the left hand traffic moved over for his emergency vehicle, but as he stated after encountered them not sharing the road and he had to slow. These left hand campers typically have plenty of time to move over prior, they either are not paying attention or are not being considerate. The reason two law enforcement officials noted in this article are for the bill, is because they know the problem is very prevalent for everyday drivers. More lane changing is done when these left lane campers are present, and the danger amplifies when lanes changes are made within a group of vehicles in a cell of congestion. Representative Andy Olson knows all too well the problem as he was once the OSP Lieutenant out of the Albany office years ago. Another issue and danger on our freeways needing attention and communicated to legislation are vehicles less than 10,000 pounds driving under our posted freeway speeds and entering a freeway at less than freeway speed. One entering a highway or freeway should never force traffic to have to slow. I understand this for some short on-ramps, but on most entries to the freeway, the gas pedal earns a spot within the right lane, not the brake. Traveling the freeways, many drivers traveling under the posted speed remain in the far right lane, and this forces semi-truck drivers to pass. This sets into motion a set of actions causing additional traffic to change lanes and slow, adding compounded density to traffic. One wrong move by one vehicle can set the scene for multiple incidents. There is no reason trucks should be forced to pass a vehicle in the right hand lane. Vehicles impeding traffic flow as a whole are a danger to the progression of major traffic flow, more-so when cars impede semi-trucks adhering to the law to keep right. Some states have implemented minimum speeds and this state needs to follow suit. People need to use the arterial highways and freeways for what they were intended, and if they cannot navigate them without causing dangerous situations then laws need to be enacted to herd them like cattle so traffic flow runs more efficient with less danger to all. yes please! It’s been shown that a left lane hogger causes more congestion, issues with road rage, and other states already have the law… I am a frequent I-5 driver and would love this. I applaud this bill! I drive Salem to Albany at least two times per week — often more — and encounter these roadblocks pretty much every single time. It’s senseless. Eric, funny you should mention the washington plates…I see them as well, more ironic is the fact Washington has an impedance law and they do ticket people for it. Apparently they are aware they can get away with it here. Well, I’m against this bill. The issue does not meet the standards of requiring yet another law. I agree that this can be an inconvenience, and can cause congestion, yet it is not contributing to danger. I have a much bigger issue with other drivers who will drive behind me on the I-5 with less a second between our cars. This happens in the right hand lane, as well as in the left hand lane when I am in the process of passing. To be clear, I may be passing in the left hand lane, at 70 mph, which is my limit on our 65 MPH roads. I may be passing several vehicles, but not fast enough for someone who thinks I should be passing at 75 or 80, thus gets right behind me, right on my tail, trying to push me into going faster. I think this type of law will simply reward such behavior, as they will think they are obviously in the right. I have yet to read the text of the law, but it seems needless to me, and I would much rather the OSP start citing drivers for unsafe tail gating in any lane. There used to be a basic speed law in Oregon, but is no longer. However on freeways speeds, even law enforcement will agree the freeways are more safe when traffic moves at a similar pace, I’ve read it in previous news articles. If drivers are more safe at a speed the majority is comfortable driving, then they are therefore more dangerous if any of the conditions noted above exist because of lanes changes both left and right being made, slowing traffic, and multiple vehicle cell congestion. The left lane is a passing lane and it has been clearly signed for years, indicating ‘slower traffic keep right’. In Germany Shawn, you would be run off the road for passing as you do. The behavior you mention is you, passing at your leisure, and it is not safe. If a driver pulls into the left hand lane, he or she should be prepared to apply the throttle before they enter the lane, not maintain their desired speed. This is NOT being considerate to the other drivers and the efficient flow of traffic. If you feel you cannot do this, then you should adjust your speed slower and remain to the right until you have the left lane long enough to yourself to pass without causing a decrease in the overall traffic speed in this lane. Otherwise you, along with multiples, are part of the problem. The freeway without additional lanes is congested enough as it is until it’s widened. Traffic vacating from populous areas more quickly is the only way to flush the urban traffic and move more vehicles. The speed limit will be increased soon as ODOT and the state have seen the averages at or around 75mph for some time and at the same time, we are among a few states which have lower speed limits on our freeway. Hi Tom, we may have to disagree here. Passing some at a 5mph differential is not congesting traffic. There is a big difference between sitting in the left hand lane and passing at a reasonable rate. As I would be the one to pay any speeding ticket, and see my insurance rates rise as well, it is unreasonable to expect all drivers to go 10 to 15 mph over the limit when passing, as some drivers suggest. As far as ‘running drivers off the road’, in Germany or anywhere, well, I know which driver is the actual danger in that scenario, and I am happy to let them pass me and go on with their day. Bullying by getting on someone’s bumper, who is already passing at 70mph is the real problem. You say 5 mph differential, but it may be more, and it’s not up to the folks in the passing in the left hand lane to discern whether this is ok. It is in fact a passing lane meant to overtake traffic, not impede traffic flow. People and you should drive to the conditions, and if the conditions dictate you go faster to pass in order to prevent backing up a stream of cars going 74mph, then it should be done. Not doing so, has implications you are failing to realize. This mentality of; I’m within the law because my speedo reads 65 or a paltry 5 over and therefore I am the pace car’, affects more than you. Who says someone else’s speedo doesn’t read something else? Who says the person behind you doesn’t have an emergency? Let the law fall to the police, let common sense prevail when driving the roads. I would never pull into another lane with the intention of doing anything less than what speeds persist. If you don’t want to do 74 and take the risk as you explained, then you should pass in the right lane which is perfectly legal in Oregon or stay within the lane and reduce your speed altogether. Whether you are entering the freeway at less than freeway speed, or passing at less than the speed at which traffic is utilizing this particular lane, a single vehicle does not and should not impede traffic flow just because the driver is afraid of a ticket. No law enforcement out there is brainwashed into believing passing is possible without occasional going over the limit, especially when it’s on a two-way road….safer to do it more quickly than more slowly unless you enjoy watching the gap between you and the car coming at you get smaller. Doing otherwise IS dangerous for all the reasons previous listed. Great logical reply Tom, I will take it into consideration. Let me see if I understand this correctly. If this new bill passes, it will make it illegal to do the speed limit in the left lane, unless you are passing someone who is doing less than the speed limit. If this is true, the City of Lebanon owes me money (with interest) from a ticket I got in April 1978 for doing 60mph in a 55mph zone on Highway 20 between Lebanon and Albany when I was passing another vehicle. I even got into an argument with the Judge who was very emphatic that the speed limit is the speed limit and cannot be exceeded without consequences. Did anyone notice that, in the above statements, the only ones who said that the left lane campers moved over were the ones in marked police cars? That’s what is known as “The Halo Effect.” You see a marked police car and you automatically begin to check your speed, what lane your in, etc. and make corrections. Did anyone stop to think that maybe we need more troopers on the freeway? I often drive from here to Eugene on the freeway and seldom, if ever see a patrol car. I had a friend who was a Sgt. with OSP several years ago and his philosophy was, “56 is speeding 54 is impeding”. This was back a few years when the posted speed on the freeway was 55. More Troopers, bring them on, as long as they stay out of sight. Many people’s eye sockets are tied straight to the brake pedal, typically if they are within reason of the speed limit…even when the police have someone pulled over, and even worse when they have someone pulled over on the opposite side of the freeway and people braking for nothing. There has always been a little buffer on the posted speed verses the speed at which OSP etc issue tickets for, otherwise the freeways would be more of a parking lot than they already are, and the courts would be chuck-o-block full. I’ve lived in Oregon for 12 years now and its always blown my mind that there’s no left lane laws here. Not having that law causes drivers to dangerously tailgate people in the left lane until they move over. I see no mention of Washington and Oregon’s idiotic laws that trucks have to go 10 MPH slower than cars. If you get off on a secondary where they maintain the same speed you will be amazed at how few trucks that you see. This greatly cuts down on the need to pass. It is about time Oregon got with it and ticketed those lane hoggers who drive with this sense of being all alone out there. James, your comment gave no direction of opinion whatsoever. As long as we start ticketing the tail-gaters as well.